It’s Pi Day tomorrow and St. Patrick’s day on Monday so I thought I’d do a little mashup homage for a little festivity. Generally I’m not one of those people who celebrates every occasion under the sun (mostly because I never have the foresight to remember the little things until it’s a tad too late), but more and more, a trip to the grocery store puts holidays on my radar. With so many green sprinkled shamrock cookies and giant Guinness displays it’s hard to ignore St. Patrick’s day. And Pi Day? I’m just a little geeky like that. Thus, I present to you, in all it’s glory: a stout-braised beef shank potato-topped pie. 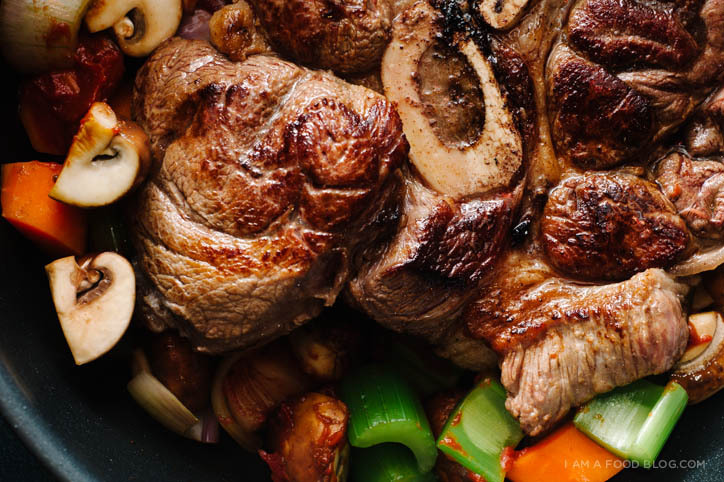 It’s a spin on a classic guinness beef stew, with beef shank instead of chuck. If you haven’t cooked shank before, it’s pretty awesome. All it needs is a little time and it turns into tender, melting luxurious chunks of deliciousness. Bonus, it’s a pretty affordable cut too. 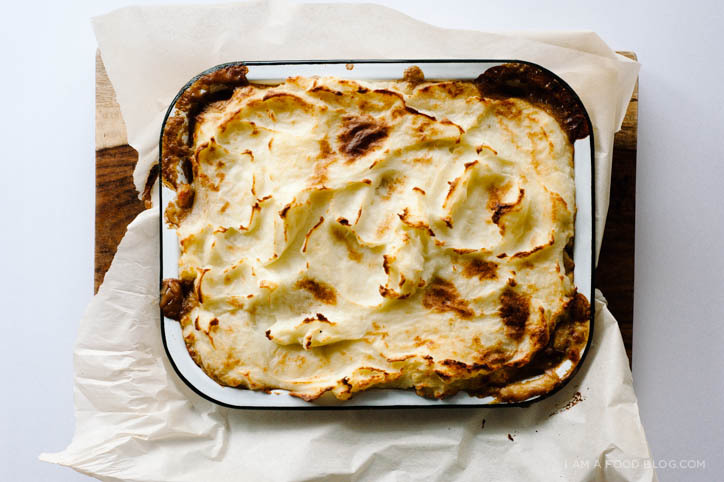 And, of course, potato topped pies need potato tops. 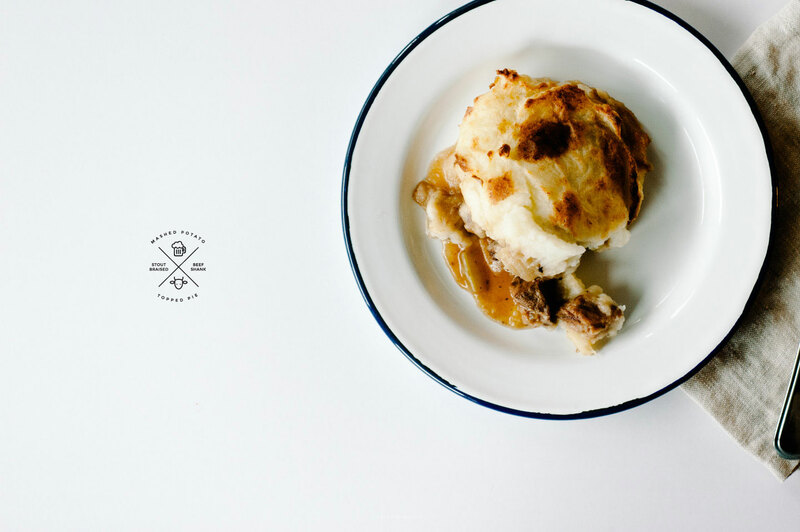 There’s something about that dreamy layer of mashed potato hiding gravy soaked meat that gets me every time. I didn’t include a mash recipe here (mostly because I winged it), so go with your favourite mash, or skip on the potatoes and serve it up with a fresh baguette. Most Irish stews are seasoned with a bit of Worcestershire sauce, but since I didn’t have any on hand I substituted in some Thai fish sauce, since Worcestershire also has fish (anchovies) in it. I also thickened up the gravy a bit with a roux, because there’s nothing sadder than a watery stew. To be honest, I’m a sucker for all beef stews, but this is one of the more delicious ones I’ve made, probably because I took to the time to braise the meat for so long. If you’re intimidated by the time investment, break it down over two days, you won’t be disappointed! Pat the beef shank dry and season generously with salt and pepper. Heat up the oil in a large pot over medium high heat. Sear the shank until a deep brown crust forms, about 5-6 minutes. Repeat on the other side and when done, move to a plate. If the pot is dry, heat up a touch of oil and when hot, add the shallots, mushrooms, carrot, celery and garlic. Stir and cook over medium heat until lightly browned, about 8 minutes. Stir in the tomato paste and fish sauce. Add the beef broth, beer and browned beef shank. Bring to a boil over high heat and then lower to a simmer. Cover the pot with a lid and simmer on low for 2 hours minimum and up to 4 hours if you have the time. The shank should be very tender. At this point I put the stew in the fridge overnight, but if you’re eating the stew as is and not making a pie, you can go ahead and taste, season if needed and enjoy! If you are going to make a mashed potato topped pie, preheat the oven to 375°F. 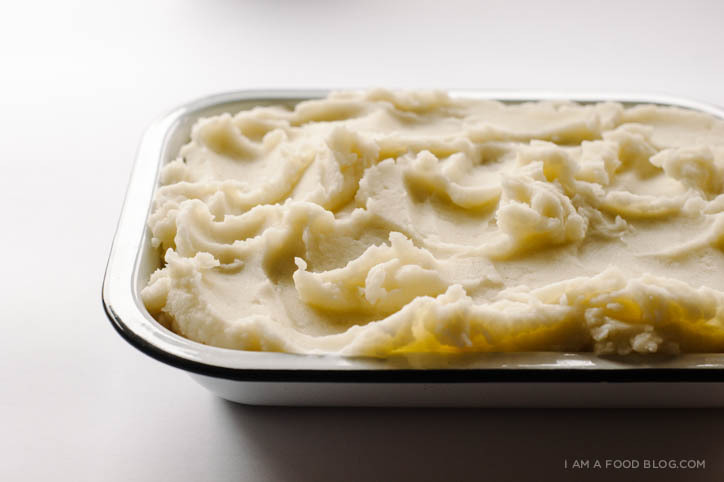 Go ahead and make a batch of your favorite mashed potatoes. 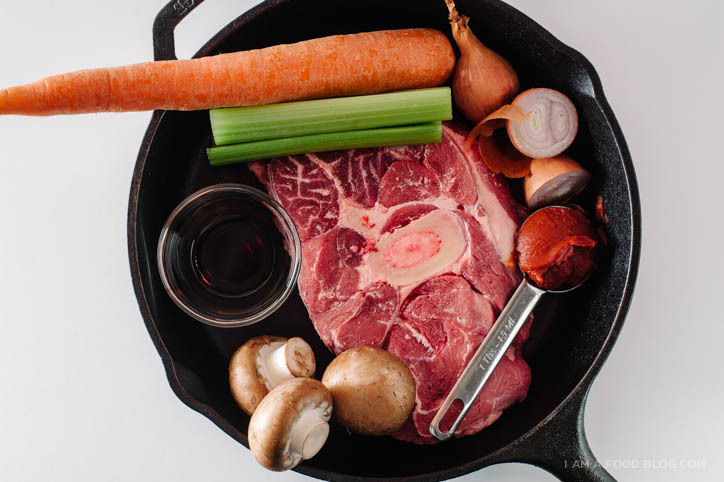 Remove the meat from the stew, chop into bite-sized pieces and place in a large oven proof casserole dish. Scoop the vegetables out of the stew and add to the casserole. There will be a lot of braising liquid left over, of which you will only need 1 cup. Save the remaining liquid though, you can always add it to other braises or make gravy. Melt the butter in a small saucepan over medium heat. Add the flour and stir until completely incorporated and slightly brown. 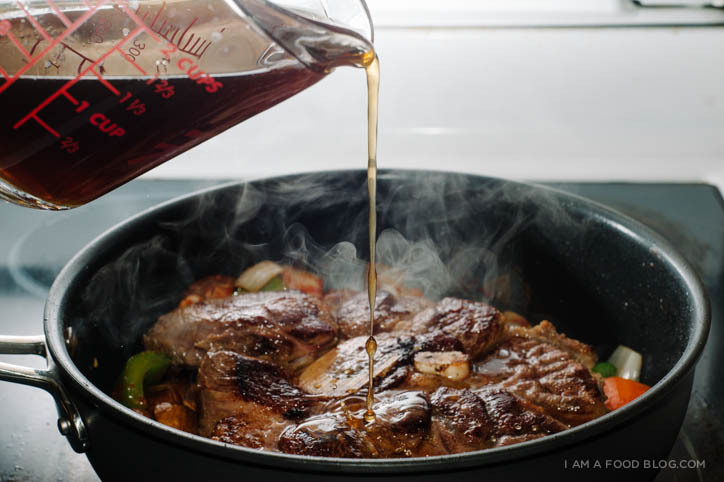 Slowly pour in your measured cup of braising liquid while stirring. Bring to a gentle boil. The gravy will thicken slightly. 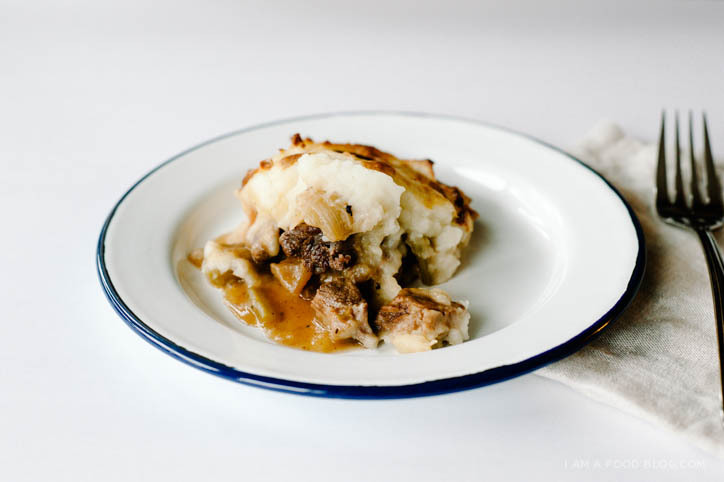 Pour the gravy onto the meat and vegetables and top everything with your mashed potatoes. Bake until the potatoes are golden brown and crispy, about 30 minutes. If needed, broil for 5-8 minutes for an extra golden potato top. Enjoy warm. My my That sounds and looks really good! 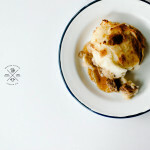 I just found your blog and love it, great pictures and great recipes. You can use worcestershire sauce instead. Hey I really like your plate in the pictures above, may I ask what the make is? It’s an Falcon enamel plate. I’ve eaten Irish stew once, when I was on holidays in Ireland but the one I’ve eaten was cooked with lamb and it was delicious. Yours looks delish and perfect nourishing dish to have on cold days!